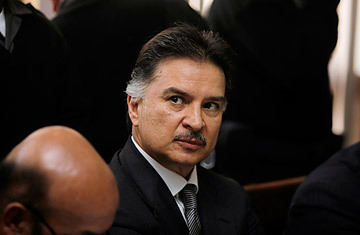 Ex-Guatemala President to Be Tried in U.S. When he was President of Guatemala, from 2000 to 2004, Alfonso Portillo promised a crusade against one of the Central American country's biggest scourges: corruption. "Corruption and impunity are part of the perverse way our political, economic and social systems function," Portillo said in 2002. A year later, he even proposed letting the U.N. establish a commission in Guatemala to help the country’s fledgling judicial institutions root out the sleaze. Guatemalan officials say Portillo's efforts paid off  at least in his case. Wednesday night, a panel of judges approved Portillo's extradition to the U.S. on charges that he laundered tens of millions of dollars that he had embezzled while he was President, including $2.5 million in donations from the Taiwanese government that was meant for children's schoolbooks. Portillo, who was captured by authorities in January near Guatemala's Caribbean coast days after a U.S. indictment was handed down, denies the accusations and calls them a political witch hunt by the U.S. and U.N. But to analysts like Joseph Tulchin, a senior scholar at the Woodrow Wilson International Center in Washington and author of Combating Corruption in Latin America, the unprecedented extradition of a former Guatemalan President "is extremely important in addressing impunity" in a country and region that are still drowning in it. U.S. prosecutors portray Portillo, 58, as a man ready to exploit his presidency for illicit gain from the moment he took office. Preet Bharara, a U.S. attorney in Manhattan, says Portillo turned "the Guatemalan presidency into his personal ATM." Guatemalan media, quoting Guatemalan government sources, have reported that Portillo's alleged take was approximately $70 million. Aside from the Taiwanese funds, he's also accused of embezzling about $4 million from Guatemala's Defense Ministry. He allegedly laundered the money through accounts in Guatemala and through U.S. and European banks. It was a financial shell game that involved overdrafts so massive, say authorities, that two Guatemalan banks are now insolvent and the country's only state-run mortgage bank is teetering on collapse. In the Taiwan case, according to the U.S. indictment, Portillo took three checks in 2000 from the Taiwanese government that were earmarked for Guatemala's Libraries for Peace program and deposited them in an account at Hamilton Bank in Miami that was held by a political supporter and friend. He then allegedly wired a chunk of it to an account at Washington-based Riggs Bank and later to a Paris bank account jointly held by his daughter and ex-wife. Portillo was indicted in New York City because some of the banks and branches he allegedly used were located there. In a statement, Bharara said his office is committed "to prosecuting those who use American banks and financial institutions to launder ill-gotten gains." Recently, the office has launched criminal cases against the likes of Osama bin Laden and a Somali pirate. Portillo faces a maximum of 20 years in prison if convicted. Under the judges' Wednesday order, he could be tried first in Guatemala on related embezzlement and laundering charges. He had originally been extradited to Guatemala in 2008 from Mexico, where he had gone to live after leaving office under a cloud of suspicion. Until January he had been free on bond in Guatemala, awaiting trial there. When the U.S. indictment was announced in January, he tried to go underground but was arrested by Guatemalan police backed by U.S. officials as well the U.N.'s Commission Against Impunity in Guatemala, or CICIG. Created in 2007, CICIG (separate from Portillo's proposed 2003 U.N.-backed anti-crime commission, which was aborted when the Guatemalan high court at the time ruled it unconstitutional) is one of the only non-governmental agencies in the world that is allowed to do autonomous criminal investigations in a sovereign country. CICIG's presence is an indication of how dysfunctional police and judicial institutions are in Guatemala, where an astonishing 96.5% of crimes are never solved. The country's murder rate is eight times that of the U.S.  a plague that was underscored on Wednesday when Portillo's extradition hearing was delayed because the judges had received telephoned death threats. Crime watchers say Portillo, elected in 1999 from the conservative Guatemalan Republican Front Party, presided over much of the deterioration of law and order despite his anti-corruption pledges. "Portillo was the person in charge of weakening the national police," says Mario Polanco, a Guatemalan human-rights activist. One of the uglier ironies of Portillo's case is that he was elected in 1999 largely by promising to stand up for Guatemala's poor, especially its majority indigenous Maya. To have allegedly pinched millions in foreign aid intended for low-income students' textbooks  in a country that has Central America's lowest literacy rate  seems especially brazen. But as he entered his extradition hearing early Wednesday morning, dressed in an expensive suit, Portillo was smiling and waving to reporters like any good politician. As President, he knew all too well how Guatemala worked, but many of his countrymen now hope his downfall is a signal that the country is finally starting to function as it should.